Venue: ASB Showgrounds, 217 Greenlane Road West, Greenlane, Auckland. You'll find the NZ Fitness & Health Expo in Halls 3 & 4 in the main pavilion. 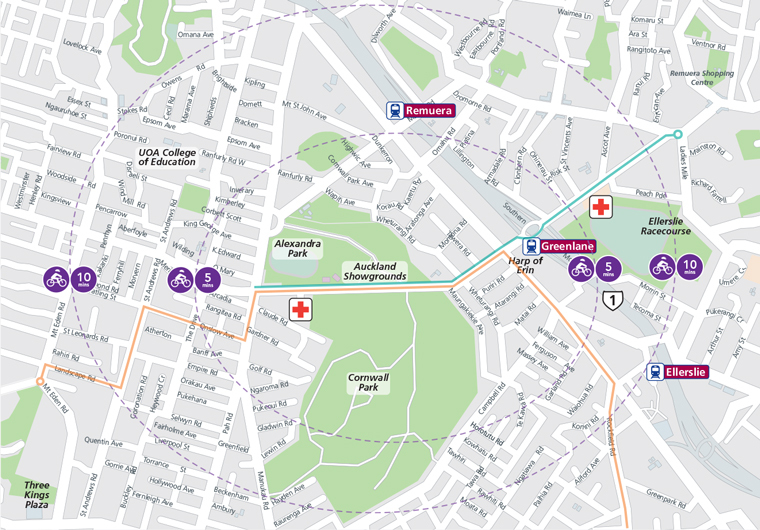 The ASB Showgrounds is located at 217 Greenlane Road West, Greenlane, Auckland, across the road from the beautiful Cornwall Park. If coming from North, get onto the Southern Motorway (going South) and exit at the off-ramp marked Greenlane. Turn right at the roundabout and follow Greenlane Road until you reach the Showgrounds (on your right). If coming from South, once on the Southern Motorway (heading North) take the Greenlane exit, turning left onto Greenlane Road and follow this road around until you reach the Showgrounds (on your right). Street parking can be found on Puriri Drive and surrounding streets. Alternatively, there is paid parking available at the ASB Showgrounds, or next door at Alexandra Park with entrances on both Greenlane West Road and Campbell Cres. Great choice! Bike racks are available for cyclists at the main entrance located at Gate 2, 217 Greenlane West Road. Please ensure that you lock your bikes securely to the rack. Bus Stops are located outside on Greenlane West Road. Visit https://at.govt.nz/bus-train-ferry/journey-planner/ to plan your journey or visit and view timetables. The closest train station to the ASB Showgrounds is Greenlane. Visit https://at.govt.nz/bus-train-ferry/journey-planner/ to plan your journey or visit and view timetables. And remember, you can take your bike on the train! Coming by taxi or Uber? Taxis and Uber Drivers are welcome to drop you off at the Greenlane West Road entrance. If you require a taxi pick up after the Show, the staff based at Show Information in the foyer of Hall 3 will be more than happy to call one for you. Pedestrian access is available from both Gate 2, 217 Greenlane West Road and (back entrance) for Pururi Drive and Alexandra Park (back entry) carpark. Please stay on footpaths and sides of roads for your safety and that of others. The ASB Showgrounds provides wheelchair accessibility throughout the venue and there are accessible toilets located in all bathrooms. Baby Changing and Feeding facilities are located in the main foyer outside Hall 4. There is also a microwave if you need bottles or baby food heated and a nursing room adjacent to the baby change room.